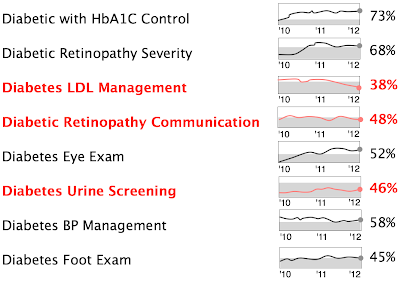 I recently wrote about Applying Kiviat Visualization to Meaningful Use Clinical Quality Measures. One additional item that is a limitation to using Kiviat diagrams is the visualization of longitudinal trending of metrics over time. This same limitation exists with Clinical Quality Measures (CQMs). This technique does make some assumptions. It appears to look decent with two years of notional data. However, I think that changes in CQM results will probably be needed over decades. Also, I am not sure if someone like Tufte would violently object to the introduction of date under the illustration.